These are used to cordon off working areas that are unsafe for both workers and the public. They typicallyare highly visible and surround a wide radius around the protected area for enhanced safety practices. If you’re short on barrier planks and traffic cones, need too-wide a radius for effective blockage, or only need to limit use of an area for a short period of time, this bright tape is an effective tool. While the requirements for your site may differ from other projects, OSHA law mandates that appropriate signage must be present and visible. 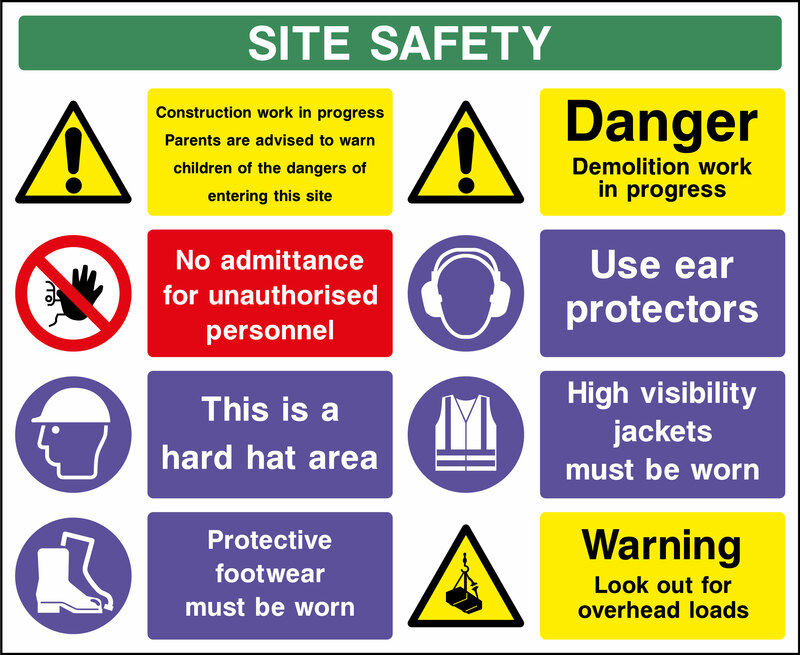 This could range from hard-hat area and ear protection signs to crane safety and scaffolding notices. One of the easiest ways to stay safe on an active work site is to stay visible. That’s why it’s essential to provide PPE (Personal Protective Equipment) clothing. Reflective clothing is also standard for outdoor sites in low light or poor weather conditions. Construction sites are full of potential hazards personnel needs to be protected from. Such protectionshould include hard hats, safety goggles, dust masks, ear protectors, work gloves, and more. Not only is it bad business to not provide your workers with access to a bathroom on your site, it’s illegal. The OSHA Sanitation Standard for Construction mandates that clean sanitary facilities are required for all personnel. When it’s time to choose a portable toilet rental for construction sites, pick a trusted company with extensive construction industry experience, like Mr. John. Sometimes, no matter how many signs, blockades, or protective gear they wear, people get hurt. It’s important to have a fullystocked first aid kit on site for small injuries, like cuts and bruises that can be treated immediately. This can also act as temporary protection in the event someone may need to go to the hospital for further care. These are for your site’s safety as well as your employees’. Security cameras often deter would-be thieves and vandals and help determine the cause of an unsafe event so it doesn’t happen again. Construction is hard work—but having to perform it in freezing or blistering temperatures will not only cause discomfort, but also potential health hazards. It’s vital that workers can stay healthy with an insulated, warm area in the winter and a shaded, cool area in the summer. The second-to-last thing you want on your site is a fire—the actual last thing you want on your site is a fire with no way to safely extinguish it.